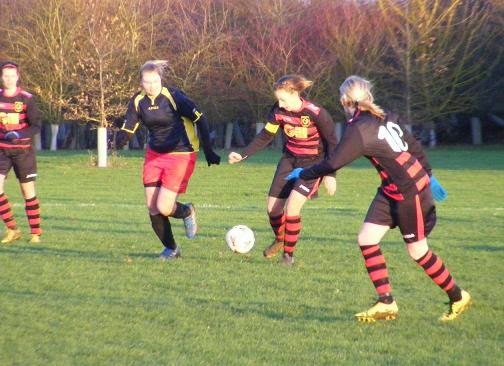 For my women's football action this weekend I travelled south down the A141 into Cambridgeshire to watch the match between Huntingdon Town Ladies & Netherton United Ladies in the Cambridgeshire Women's Premiership. The new name for the top level of women's football within the county this season this was my 1st look at a league match at this level this season. A clash between 2nd and 3rd in the league going into the match with both teams on 10pts. 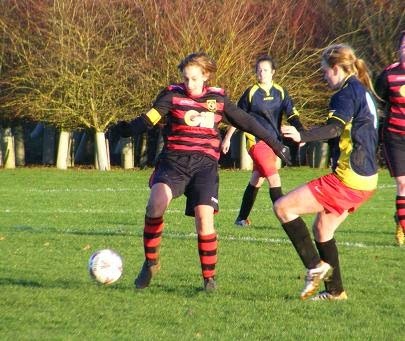 Huntingdon Town Ladies have played 6 games, have won 3 drawn 1 and lost 2, have had a lengthy lay off due to postponements hadn't played a game since the 19th October,only returned to match action last weekend losing 1-0 to Cambridge University Women. In that time Netherton United Ladies have caught them up on points have played 2 games more, their record after eight played 8, won 3, drawn 1 and lost 4. The Peterborough based side were looking to get back to winning ways after losing 5-1 to Fulbourn Bluebirds last time out. The venue, Jubilee Park, the home of Huntingdon Town FC, a new built ground on the outskirts of the town. A very nice footballing facility, easy to find I was there in plenty of time, which is something I've not had much luck with this past month. As well as the main pitch which wasn't in use today the site boasts a number of extra pitches, the one for todays match exposed to elements as it was a bitterly cold and windy day. The other matches in the Cambridgeshire Women's Premiership today had been postponed so it was a relief to know find the one I wanted to see was on. Huntingdon Town Ladies squad - Amy Rae, Rachael Bowd (C), Shephanie Day, Natasha Dowdell, Emma Clark, Barbara Williams, Amy Chapman, Claire Knox, Joanne Bull, Megan Stow & Sian Gamble. Netherton United Ladies squad - Sophie Heather, Hannah Chapman, Megan Parrett, Alice Flowers, Stacey Fullicks, Natasha Anderson (C), Alice McNicol, Delia Festini, Shannon Hilton, Chloe Schulze, Rachael Anderson, Kerry Camwell & Tia Vacca. Before the match started both teams participated in taking a joint team picture to mark the centenary of the 1914 Christmas Truce during World War One. Football Remembers. It has been a wet period the pitch does look heavy, a good size a few bobbly patches around as the bare 11 of Huntingdon in red and black hooped shirts and socks with black shorts kick off the 1st half against Netherton lined up in navy with yellow trim shirts, red shorts and black socks. The opening exchanges are concentrated in the middle of the park Netherton playing with one up top and 5 across the middle. Huntingdon have a couple of free kicks taken from 40 yards out, both played into the box Netherton goalkeeper Sophie Heather comes and claims both times. Getting onto the ball wide on the left Netherton's Alice McNicol looks to drive forwards make a run into the box, Huntingdon's Claire Knox has tracked back to put in a good tackle on the edge of the area to deny McNicol a goal scoring chance. On the attack Huntingdon press forward in number, with Emma Clark linking up well with team captain Rachael Bowd playing the ball into her feet outside the box, Bowd turns and shoots the effort blocked by Netherton's Rachael Anderson, the ball spins loose to the left of goal, Clarke having continued her run meets the ball her strike claimed by Heather at her near post. A good spell of pressure from Netherton in their opponents half is broken as defender Megan Stow wins the ball back and sets up a counter attack the ball played through the centre is played over the visitors defence for Huntingdon striker Sian Gamble to chase, Netherton keeper Heather is quick to react coming out of her area to kick the ball clear. GOAL! Following up from the break Huntingdon put the Netherton back line under pressure the ball is won by Claire Knox on the edge of the area, on the ball she finds the space to have a shot on goal and puts the ball into the back of the net to give Huntingdon the lead 1-0. Netherton get the ball out into McNicol out in space on the left again her progress down the flank is halted as Huntingdon's Shephanie Day puts in a sliding tackle to send the ball away for a throw. The ball from the sideline has plenty on it launched into the area falls loose around the near post area, Huntingdon goalkeeper Amy Rae reacts quickly putting her foot through the ball to safety. Heather makes a smart save from a Huntingdon corner played into the box from the right a good delivery it goes over the two Netherton defenders that jump for it in the middle comes through to striker Hannah Chapman, has a stab at goal instinctively at close range, either side of Heather and she can't react in time, the shot is straight at her however and she holds onto the ball well. GOAL! Netherton pull the scores level. 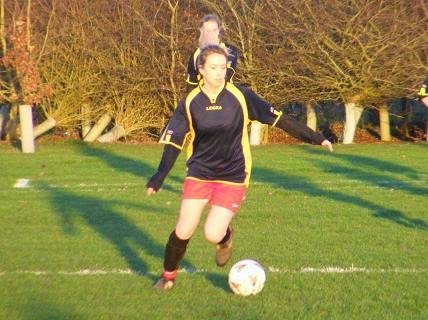 The visitors win a free kick wide right as Day brings down McNicol as she attempts to push on with the ball. It's Rachael Anderson over the set piece, she looks to send the ball in towards the near post area, the ball coming in at pace is high goes over everyone, Rae throws herself up to get to it, can't reach it as it sails in under the bar to make it 1-1. Huntingdon's Natasha Dowdell is getting some joy on the ball in the middle finding space between the Netherton midfield and defence, peels off into the right channel played a high looping ball into the box the ball bouncing Netherton captain Natasha Anderson stays composed and holds of the challenge from Huntingdon's Chapman as she clears the ball. Netherton bring on substitude Tia Vacca for Megan Parrett. It's Huntingdon on the attack down the right Knox plays in an early cross into the box looking for the run of Sian Gamble, Heather comes out and takes the ball as Gamble closes her down. Not long after Gamble has a strike as she peels off to the far post area to meet another ball fired in from the right, the shot is hooked off the line by Day, Netherton clear. GOAL! Huntingdon win a free kick 25 yards from goal on the right hand corner of the Netherton area, it's Bowd over the ball, looks to play a low ball across the 18 yard line for a team mate to run onto, goes to soon beats the referee's whistle, gets a 2nd attempt to put the ball in. This time looks to put a high ball in towards the far post, is into the wind, scrambling back Heather throws herself at the ball but it's too high for her as the ball finds the top corner and is in 2-1. End to end action both teams are making full use of the pitch, Netherton's Chloe Schulze, looking to support Chapman up front hold the ball up well, lays it off into the run of Stacey Fullicks to her right, she powers forwards squares a low cross along the six yard line looking the run of Chapman, Huntingdon's Stow makes a vital interception. GOAL! Netherton pulls the scores level again the ball is played into Chapman peeling out to the right, she turns her marker and sprints forwards with the ball, drives inside running along the 18 yard line looking for an opportunity to unleash a shot, when it comes the attempt is blocked the ball deflected spins out to the left inside the box it's Schulze who latches onto it two strides and she finds the room to let fly from 8 yards drills the ball into the back of the net 2-2. A lively and entertaining 1st half with Huntingdon taking the lead twice only for Netherton to peg them back both times, everything was set up for the 2nd half. Huntingdon have no subs to bring on to rest tired legs. Netherton kicking off the 2nd half have Megan Parrett back on the pitch with Vacca off, Kerry Camwell joins Hannah Chapman up top as the visitors go with 2 in attack. Huntingdon have the 1st attempt on goal as they break Dowdell beating two players before playing the ball into Gamble, she has a strike from outside the box, puts it straight at Heather who makes the save. Heather saves again not long after as Dowdell finds Gamble out to the right of the box this time she passes it seeing the run from Amy Chapman in the centre, on the turn she gets her shot away, Heather reacting quickly to get down and save on her six yard line. Netherton captain Anderson defends well as Huntingdon's Clarke gets onto the ball in the middle and stealing a yard on her marker breaks into the area, Anderson keeps with her pushes her wide gets the tackle in to win the ball set's up a counter attack getting the ball forwards Megan Parrett in the middle prods it forwards for Kerry Camwell, Rae though is quickly out of her box to get the ball away. Huntingdon's Joanne Bull is winning her fair share of tackles in the middle of the pitch, making a forwards run lays the ball off to Gamble who holds the ball up well under challenge, Bull continues her run Gamble finds her pushing on the ball comes back to Bowd who blasts her shot over the bar. Strong running from Netherton's Parrett as she takes the ball across the pitch passes it out into the feet of Chapman wide on the left, she fires the ball into the middle Day gives away the corner. 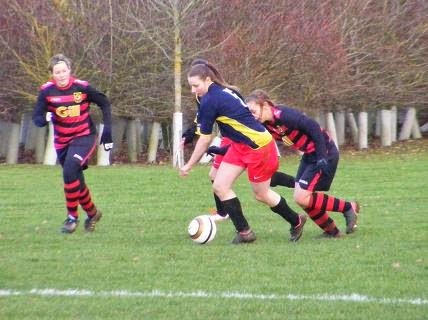 The set piece comes into the box into Schulze she can't get the shot away as Huntingdon win the ball and break with Bull looking to push forwards, Netherton's Alice Flower makes a vital tackle to prevent the Netherton goal being exposed. The wind has picked up and the afternoon wears on favouring Netherton in attack, with 2 up front the visitors are getting more possession are pushing Huntingdon back. Win a corner played in from the right to the centre of the D, Camwell misses her shot as the ball comes through to Schulze behind her 18 yards out she lets fly but the shot is straight into Heather's gloves. GOAL! Huntington take the lead for the 3rd time in the match, Huntingdon having been pushed back put the Netherton box under seige for a couple of minutes, working the ball across the pitch the ball is put into Gamble on the right of the box, strong she holds the challenge off, turns and shoots a low strike with plenty of pace across the six yard box looking for the far post bulges the side netting, 3-2. From the restart Netherton's Stacey Fullicks coming in from the right has a 1st time strike at goal as the ball comes back out to her after Chapman does well to keep possession of the ball inside the box sees Fullicks run towards her plays her in, the shot a curling effort outside the box is wide of target. GOAL! Netherton pull the scores level for the 3rd time in the match. Camwell is the scorer a brilliant strike from 20 plus yards as the ball is played into her from Shannon Hilton from midfield, central to goal she has the time and space to line up a shot sends the ball past Heather and into the net 3-3. Netherton have more of the ball in the 2nd half keeping it on the ground are looking for an opening with Parrett and Hilton in the middle looking to find their wide players as much as they can stretch Huntingdon. From a corner delivered from the right Fullicks making a run from the centre towards the near post leaps and meets the ball with her head puts her effort wide into the side netting. GOAL! Netherton take the lead for the 1st time in the match. The move starting with Hilton who wins the ball in the middle looks to put a high ball into the Huntingdon box the defensive header only sends the ball on into the box Fullicks running in from the right causes problems in defence at close quarters her shot is half blocked squirms through to Chapman ahead of them both who turns and sends her low strike into the net 3-4. Huntingdon press forwards looking to get back into the match, Gamble has a shot from wide left that goes behind for a goal kick. Gamble then turns provider putting a ball into the box for Chapman to run onto coming out to meet her on the penalty spot Heather does enough to put her off. Huntingdon with a corner from the right, Clarke headers the ball on into the middle, Day is there to meet the ball her powerful shot is blocked on the line by Rachael Anderson. GOAL! Virtually the last action of the match, Netherton have a 5th goal, on the break have got players forwards late in the match, the ball is played into the area early from the left it's Parrett who has made the run finds herself furthest forwards keeper Rae comes for the ball but fails to collect, Parrett steals onto it and has an open goal to shoot at doesn't miss 3-5. 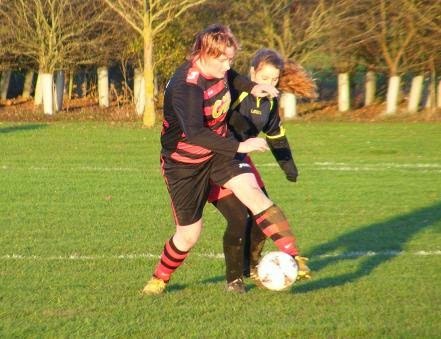 It's Netherton that claim the 3pts to climb above Huntingdon into 2nd place in the Cambridgeshire Women's Premiership, having come back from being a goal down 3 times to go on to win. 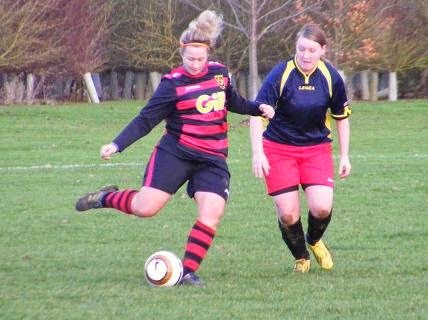 A great game to watch, lively and committed from both sides, another good advert for women's football in Cambridgeshire. I appreciate and thank both clubs for the help they gave me with the squads today. Great game better than watching men's football if you get the opportunity to come and support the Ladies you will not be disappointed..